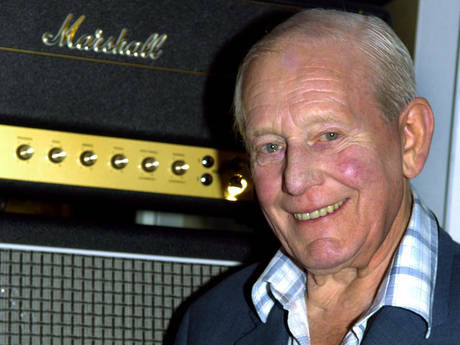 Jim Marshall popularly known as the Lord of Loud the pioneer on guitar amplifiers has died today. He was 88. He his known to have worked for some of the greatest names in Rock Music. A spokeswoman for the company he founded said he passed away in Milton Keynes, southeast England, on Thursday morning. She could not confirm reports that he had been suffering from cancer and had a series of strokes. “It is with profound sorrow that we announce the passing of our beloved founder and leader for the past 50 years, Jim Marshall,” said a statement on his company’s website. Tributes poured in for a man credited with helping to shape the sound of guitar rock. Marshall is revered as one of the four forefathers of rock music equipment along with Leo Fender, Les Paul and Seth Lover. Previous: Gary Sinise Hurt in Auto Accident! Next: Texts From Hillary – Is Hillary Running the World ?